What you need to know about printer ink and cartridge problems. The basic colours used by an inkjet printer are cyan, magenta and yellow (CMY), plus black (K). Originally most inkjets had only two ink tanks: black and a tri-colour cartridge. When one colour ran out, the entire cartridge had to be replaced. Now most of the top-ranking inkjets have four or more ink tanks. You can certainly see the impact on quality. Photo cyan (PC) and photo magenta (PM) are among the inks appearing more often. These are lighter colours – about half the saturation of regular cyan and magenta. Other new inks are solid colours such as red and blue. It's more efficient to print directly from one tank, rather than generate a red or blue from CMYK print-heads. Then there are "gloss" inks – these are used to overprint a clear lacquer, giving a glossy surface to the print, and possibly helping its archival properties. 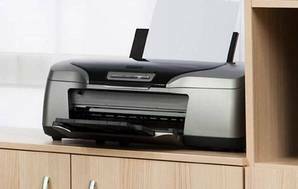 Ever wondered why many printers are so cheap to buy? Here's a reason: they cost big money to run. Just 3 or 4 replacement ink cartridges could cost you more than you spent on the printer itself. Use our running cost calculator to work out how much our tested printers will consume in ink (and paper) over a year, personalised to your usage. You might be surprised to find how much ink some models waste. Where does it all go? In inkjet printers, a lot of extra ink usage is due to the print head cleaning each time the printer is turned on, and in some cases off. There's another trap to watch out for. Some printers use a combination of CMY colours to produce a black result, rather than draining the black cartridge (which is considerably cheaper to replace). Customers only become aware of this when they find they have to replace the colour cartridges after printing nothing but mono pages for some time. Switching the settings to "greyscale" or "draft quality" should fix the problem. It forces the printer to default to the basic black cartridge ... usually. Our advice: if you're planning to use an inkjet for a lot of mono printing, remember to ask the retailer whether there's a way to prevent it from using the colour cartridges to generate black. If you're misled about this at the point of purchase, then under the Consumer Guarantees Act the retailer has an obligation to replace the printer you bought with one that can do what you asked for. One option for keeping the cost down is a third-party ink cartridge or cartridge-refill kit. Printer manufacturers would rather you didn't use these, as they make considerable profit from selling their own ink, toner and paper. Some even threaten to invalidate your warranty if you use other-brand products. The choice is yours. Consumer tests overseas have shown that some third-party products are just as good as proprietary ones. And several of our members have reported good success with refills, and excellent savings on running costs. Watch out for printers – inkjets or lasers – that are sold with "starter" cartridges. These contain half (or even less) of the usual amount of toner or ink, and consequently have a greatly reduced first yield. Make sure to ask the retailer whether the printer you're considering includes a full-size cartridge as part of its price. If not, try bargaining. They may be prepared to upgrade the starter to a standard cartridge. We look at common problems with ink cartridges and what you can do to fix them. Compare printer test results and reviews, check our recommendations and find out more about choosing the best printer for your needs.